You know that repeating the same words and the same instructions—or simply announcing the answers to questions—doesn’t help students learn. How do you get past the predictable and really teach your kids how to learn? Douglas Fisher and Nancy Frey say that helping students develop immediate and lifelong learning skills is best achieved through guided instruction, which they define as “saying or doing the just-right thing to get the learner to do cognitive work"—in other words, gradually and successfully transferring knowledge and the responsibility for learning to students through scaffolds for learning. 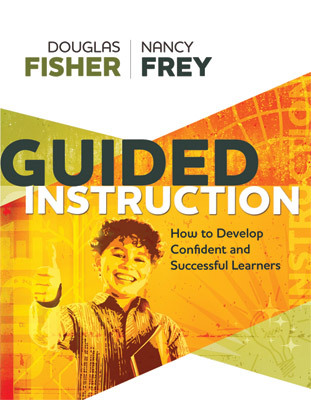 In this helpful and informative book, they explain how guided instruction fits your classroom and works for your students. Questioning to check for understanding. Prompting to facilitate students’ thinking processes and processing. Cueing to shift students’ attention to focus on specific information, errors, or partial understandings. Explaining and modeling when students do not have sufficient knowledge to complete tasks on their own. Each element is thoroughly explained and illustrated with numerous examples drawn from the authors’ extensive experience in the classroom and their observations of hundreds of expert teachers, as well as a broad sampling of relevant research. Aimed at teachers at all grade levels, across the curriculum, Guided Instruction will help you provide timely and meaningful scaffolds that boost students to higher levels of understanding and accomplishment.